Beverstone Castle was originally an early 13th century fortified stone manor house, founded by Maurice de Gaunt. Encased by a wide ditch, in 1229 King Henry III, granted Maurice a Royal Pardon licence to crenellate Beverestan. In the early 14th century, Thomas, Lord Berkeley remodelled the castle, building a small quadrangular castle, with a two storey, twin-towered gatehouse. In 1664 during the Civil War, the castle was twice besieged, before being taken by the Parliamentarians. 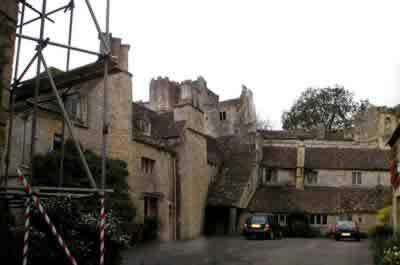 Only the west range and one D-shaped tower of the gatehouse now remain, with a late 18th century house standing on the site of the 13th century hall. The west range, which contained the solar above a vaulted undercroft, is flanked on the angles by square towers. The gatehouse had a large first floor chamber and its gate passage was defended by a portcullis. 3 miles west is Lasborough Castle and 13 miles east is Ashton Keynes Castle. Beverstone Castle is located in the village centre, off the A4135. 18 miles south of Gloucester, on the A46-A4135.